Each year in the US rear end collisions result in approximately 10,000 fatalities. Rear end collisions are almost always avoidable and normally result from one vehicle following another too closely or one vehicle not seeing another in time to stop. The majority of these types of collisions can be avoided by increased vehicle conspicuity and driver training. This article is going to deal mostly with vehicle visibility, however, I want to very quickly comment on driver training. This will involve teaching drivers how to avoid collisions by keeping a safe distance between them and the car in front of them. Also, for cars following to closely behind them they can do things like tap the brakes or slow down to a speed that will encourage the tailgater to go around. When stopping on the side of the road drivers should immediately put out cones or other devices that will alert other drivers that there is a work zone ahead. These are just a few things that a proactive driver can do. 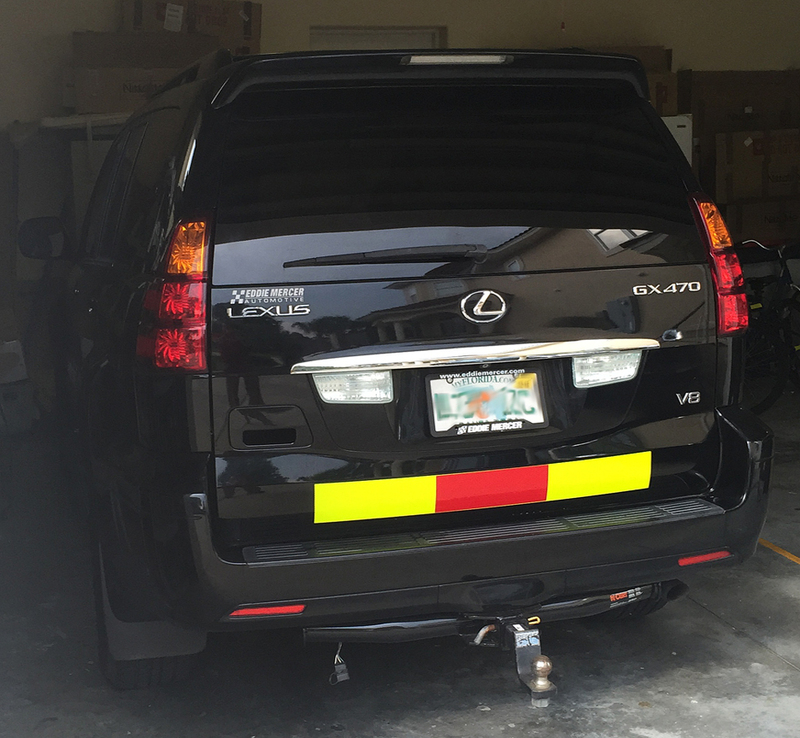 Vehicle conspicuity is easily increased through the use of high visibility reflective panels on the rear and sides of a vehicle. 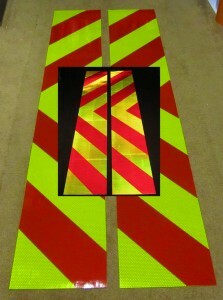 Studies have shown that through the use of bright reflective panels (chevrons), accidents can be reduced by 15% – 41%. The higher the visibility, the greater the reduction in accidents. For example, a company in Maryland had 47 trucks. In 2011 they had 8 rear end collisions where their trucks were struck. 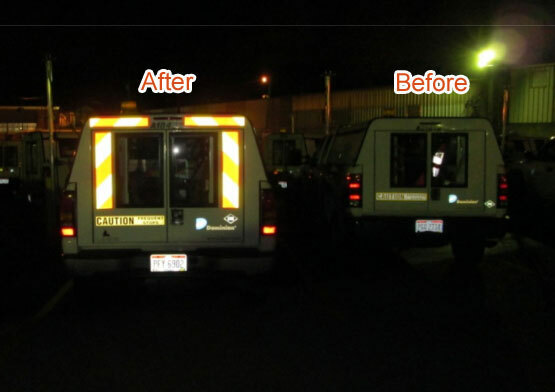 At the end of 2011 they applied high visibility red and fluorescent lime yellow panels to the backs of every truck. In 2012 they had 1 collision. 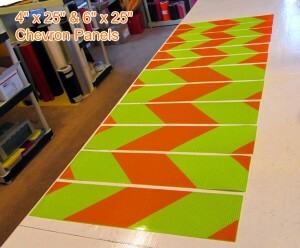 Most companies will measure the free area on the back of their vehicles and then determine what types of panels will fit into the free areas. When making this assessment you will normally try to keep reflective panels several inches away from tail lights. Also, the lower the panel to the ground the better it will reflect as cars get closer. This is due to the angles of light to a from the panels. The goal is to have at least part of the panels or one panel in line with a cars headlights. If they are too high they will reflect well from a distance back to the driver but will start to dim as they get closer. This is of course not an issue in the daytime. Only at night. The most popular color combination is red and fluorescent lime yellow. Fluorescent lime is an unusually bright color and gets a viewers attention faster than standard colors. Red is an excellent offset. Orange and Fluorescent Lime Yellow is another good combination. Both are highly conspicuous and both create a contrast of from 2.5 – 3.0 to 1. It is important to use prismatic reflective films as they are several times brighter than standard reflectives. This means that an approaching car can see the material from over 1000 feet away versus a few hundred. In high speed traffic or low visibility conditions this is very important. Decals can have slanted stripes like a chevron panel or they can have horizontal or vertical stripes. Both are fine. Slanted stripes or chevrons may be more conspicuous but if you are wanting your vehicle to not look like a fire truck or emergency vehicle then non slanted stripes will work fine. There are no laws or regulations that I know of that prevent you from using either type.